Polish quintet (on this album, the band’s line-up is: Konrad Zubrzycki (d), Lukasz Sikorski (v), Maciej Jakoniuk (g), Lukasz Bielemuk (g), and Rafal Zera (b)) Cinis finally return with their second opus (the former one, The Last Days Of Ouroboros, was initially released in 2008). This new full length was recorded at the home studio of former Via Mistica’s Marcin Sidz, with exception of the drum parts, which were done at the famous Hertz Studio. In that very same studio, mix and mastering were done with engineering and production duties taken care of by the famous Wieslawsky-brothers Slawek and Wojtek (think [while staying in between Polish borders]: Vader, Vesania, Crionics, Shadows Land, Behemoth and tens of others). Subterranean Antiquity is quite a ‘logical’, ‘evident’ piece of Polish craftsmanship. The album stands for that kind of rhythmic, highly technical and fast-forward Death Metal that sort of characterizes the Polish scene since more than two decades. It consists of all ingredients that are needed to have a result so tasteful and attractive: deep gurgling grunts, non-stoppable drum patterns and fierce percussion, lightning-fast riffing versus pounding decelerated rhythms, down-tuned bass lines, chilly and / or piercing leads, and a sound that is as monumental as it is professional (courtesy of the clan-Wieslawsky, as told before). Damn, it reeks of a lack of originality. Actually, that’s true, completely true. Not once this album comes up with something that might the listener leave confused, thinking ‘damn, I need to repeat this piece’ for one reason or another. It is not that Cinis are playing on safety, but prediction and preparation aren’t strangers. The tempo mainly focuses on high-speed assaults with some decelerations; the latter ones being at least as forceful-forward and powerful as the fast ones. And after a while, I guess you might have seen / heard it, with the chance of losing your interest. Where’s that little ‘more’ that convinces, that thrills, that makes you aroused? But then again, seen from qualitative point of view, one cannot deny the strength of the song writing, nor the persuasive performance (and I did mention the massive production before, didn’t I). 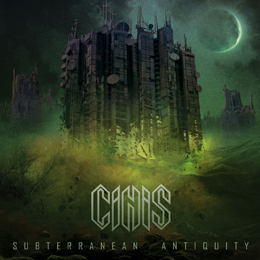 So, I do not think fans of Calm Hatchery, Vader, Dies Irae, Yattering, Masachist or Decapitated would be disappointed by Cinis’ Subterranean Antiquity, nor those who can appreciate everything in the vein of Nile, Morbid Angel or Suffocation.